you can see the glossy accents on all of the peppermints and candy canes and kind of see the wink of stella on the roof lines here: shiny! I have to admit, I'm a little impressed that I could (mostly) line all of these tiny little stamps up enough to stamp that background, since I was stamping all over the paper, the MISTI wasn't really going to help here so I just stamped this with an acrylic block. Anyways, there was a lot of stamping, but it was a pretty simple card. I started off by drawing a light pencil line across a piece of Neenah cardstock cut to 4 1/8" x 5 3/8", about a half inch or so up from the bottom. 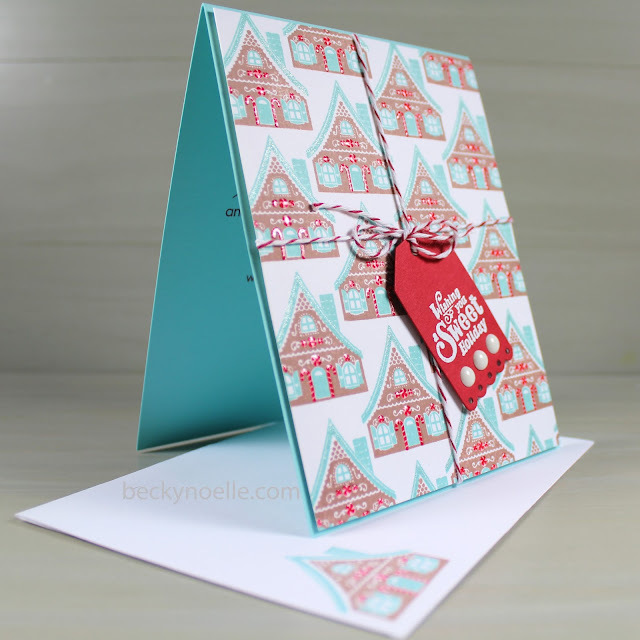 I used that line as a guide to start stamping my houses, I stamped each row of houses and then the roofs before moving to the next row (i used the chimney as a spacing reference so i needed the roof stamped to see where to put the next row). After the houses were all stamped I went back and stamped all of the little details, the door and windows, the candy canes, and all of the peppermints. I tied a piece of baker's twine around the stamped panel and then mounted it on a blue card base with foam adhesive. I die cut the tag out of Pure Poppy cardstock and embossed the sentiment in white embossing powder. I tied the tag on the card with the twine and added a piece of foam adhesive underneath it to keep it in place & I added three enamel dots to the bottom of the tag. I finished the card off with some Wink of Stella shimmer on the roofs and glossy accents on all of the peppermints! Bree and I are off to a petting zoo today, wish us luck! Such a sweet card! I love the colors, and appreciate your efforts in lining up all the tiny details in the stamping! Have fun at the petting zoo - it is pouring down rain here!